Is there anything special about the geology of the Park? Yes, indeed, there certainly is. Many of the processes currently active in and around the Park are essentially unique to our area. As with so much of geology, the basic driving mechanism is plate tectonics. Locally we have "extremely oblique extension". In functional English, what is happening geologically is more-or-less as follows: The western edge of North America, from the Gulf of California north to beyond San Francisco, is attached to the Pacific plate, and is moving northwestward with respect to the rest of the continent, at about 35 to 40 miles per million years. This situation developed gradually over the last 25 million years or so, and became firmly established in our area about 7 million years ago. However, in the general Anza-Borrego/Salton Sea region things are more complicated. Here the "San Andreas fault" actually is a network of more-or-less parallel faults that together do the work of the single strand further north. The most easterly of these faults is the San Andreas proper; the westernmost, the Elsinore fault, runs through the western edge of the Park. Between these two are many small and not-so-small faults. Some appear to die out along their length, and many bend this way and that. This has important geological consequences. Equally important for the appearance of the Park is the fact that here faults of the San Andreas system are not strictly parallel to the trend of the continental margin, but instead are aligned so as to carry slices of North American crust slightly out-to-sea, as well as toward the northwest. The net result is extension: the western edge of the continent is being stretched. Stretching the crust of a continent, like stretching essentially anything, causes it to thin - and as it thins it sinks (remember gravity), creating basins into which running water can dump sediment - sand, gravel, mud and the like. Meanwhile, some of the bends, kinks and other perversities in the fault system cause localized squeezing, which in turn results in huge blocks of ancient "basement" rock being thrust upward. This combination of up-thrusting and subsidence is what gives the Park its unique geological character. To summarize (resorting to a bit of geological jargon): Forces originating in the relative motion between the Pacific and North American plates are tearing the southwestern edge of North America apart. 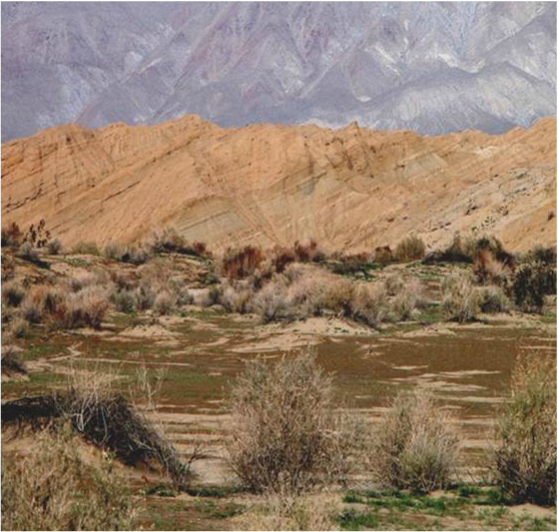 The Anza-Borrego Desert State Park is right in the middle of the tear. Owing to the distributed, obliquely divergent nature of the relative motion, subsiding, sediment-trapping basins and steep-sided uplifts of ancient basement rock have developed and continue to develop. (We are in an active earthquake zone, after all). 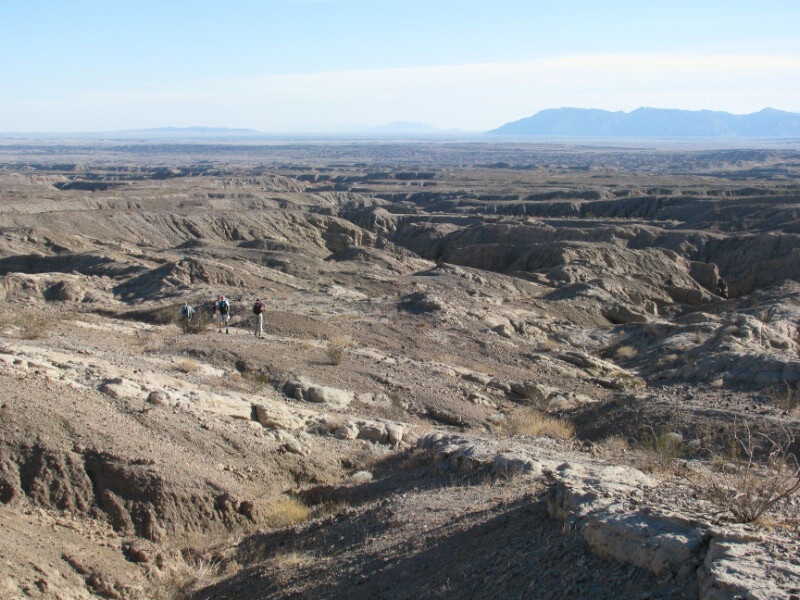 As the system evolves, what was once a low sediment-filled basin may itself be uplifted, tilted, and the sedimentary strata involved folded and faulted. The result is a lifetime of full employment for geologists attempting to make geologic maps of the Park, as well as a blessed abundance of fossils that were once buried in the basins but are now uplifted and exposed at the surface, to keep the members of the Paleontology Society busy and feeling useful! Photograph from "Fossil Treasure of the Anza-Borrego Desert"